Russian Bear Dog - Are You Really Ready For A Caucasian Shepherd? You are here: Home / Breeds / Russian Bear Dog – Are You Really Ready For A Caucasian Shepherd? If you’re considering owning a Russian Bear dog, you’re in for a whole lot of dog! Read on for background information on the breed and what to expect if you bring one home. Where Does the Russian Bear Dog Come From? This dog is thought to have originated in the Kavkaz (Caucasus) mountain range in Eastern Europe. This mountain range extends from Europe into Asia and passes through Russia, Georgia and Azerbaijan. It is therefore thought that these dogs are closely related to Asian mastiff and Balkan sheepdog breeds. Originally, Russian Bear dogs were used to guard livestock from predators. In this regard, they proved extremely efficient and cost-effective. One review paper suggests that livestock guarding dogs, actually contribute to carnivore conservation since they repel predators without killing them. This is especially true with regards to wolves, as the guard dog views them as the same species and will naturally defend a territory from them. Historically the guard dog-wolf relationship is thought to have contributed to the long-term coexistence of sheep and wolves. Russian Bear dogs were also used as general guard dogs and bear hunting dogs – which is where you might think their name comes from. Once you get a look at one though you might be more inclined to correctly believe they are so-named after their bear-like size! Combined with their guarding instincts, their size has also made them useful as formidable prison guard dogs in Russia, a position many still hold to this day. Russian Bear dogs are the most powerful sheepdogs in Caucasia! They also have huge appetites and can eat up to two large bowls of food a day, depending on their size. There are two breed types of Russian Bear dog – the Mountain type and the Steppe type, each with their own distinctive appearance. The Mountain type has a long coat and heavy build whereas the Steppe type has a short coat and lighter build. However, either way the Russian Bear dog is a large to extra-large, muscular dog breed, weighing in at 99-170lbs and standing at 23-30 inches. Coat colors are numerous and can be white, black, grey or red and everything in between! Markings can be white, piebald or brindle. The Russian Bear dog is fearless, bold and of a dominant disposition, making this breed largely unsuitable for fearful/timid owners. In the right family this dog is soft, kind and loving to the people and other animals he/she may live with. They will also be fiercely protective of them against strangers or threatening situations. This means that your dog may not do well with house visits from strangers and you should plan accordingly. Unlike herding breeds, Russian Bear dogs don’t bark or jump around much. They are bred to be independent and assertive meaning that training is key. They are also intelligent dogs that need stimulation and exercise to thrive. Without adequate stimulation exercise aggression can become a problem since they are naturally fearless and have been bred to be formidable guard dogs. This aggression is innate. One study found that the serotonin receptors of the canine brain are involved in impulsive, aggressive behavior. This may one day make it possible to test for overly aggressive impulses and/or medicate dogs that show excessive biting behavior. However, training is essential to curb natural protective instincts to attack when no attack is warranted. Read on for more information on training your Russian Bear dog. All dogs benefit from training but because of this breed’s bold nature, training is even more important. Independent dog breeds like this one can be a handful where obedience-training is concerned, although it depends on the individual dog. Russian Bear dogs are often eager to please, making training potentially pleasurable for both of you. It’s especially key to socialize your dog in order to prevent mishaps such as attacks on the repair man or on strangers who stray too close! A firm but positive approach to training works best and fully training your Russian Bear dog can take a while. All your patience will pay off though when you have a dog that knows what’s expected and that you can trust in novel surroundings. Russian Bear dogs don’t need quite as much exercise as some other large breeds, like German Shepherds, but they will still benefit from hour long daily walks. Check out our training guides for more information how to best educate your dog to be the loyal, protective and safe dog you’ve always wanted. Russian Bear dogs are generally a healthy breed that will live for 10-12 years. However, they can suffer from hip dysplasia like many other large dogs. Hip dysplasia is a developmental condition where the ball and socket joint of the hip are deformed so that movement becomes limited and painful. It often co-occurs with osteoarthritis to affect your dog’s gait and how easily he/she can get around. Although it can be present in any breed, larger dogs appear to be more prone than smaller dogs. One study in Lithuania found that around half of the 70 Russian Bear dogs (AKA Caucasian Shepherds) studied had hip dysplasia. Hip dysplasia is a complex condition and we still don’t fully understand all the elements that cause it. Luckily, there are several ways to diagnose and treat the condition. The classic test is a simple x-ray of the hip joints, although clinical signs don’t always match up with what the x-ray seems to show. Therefore, several other diagnostic tests have been developed to be used in combination with radiography. Ask your vet about which techniques would work best for your dog and bring up any concerns you have over their gait or general wellbeing. Since hip dysplasia is a developmental condition that worsens with age, it’s important to diagnose it as early as possible. Although signs are rarely present in puppies under 6 months. finally, if warranted, surgery to replace degenerative joints. Russian Bear dogs need daily grooming sessions – these are a wonderful way to bond with your dog at home! The long-haired Mountain types will require more attention in this regard than their short-haired counterparts. Both types have a thick double coat, necessary for proper temperature regulation that should not be shaved off in any season. Shedding will be an issue in the spring, particularly for the Mountain type, so you should expect to spend some extra time vacuuming. You may wish to invest in furniture covers to protect your couches from the hair onslaught! Russian Bear dogs are massive and they don’t stop growing until they are two years old. Meaning they will need to be fed breed-appropriate puppy food for that long, and high quality adult food afterwards. Proper nutrition is essential to make sure they grow and develop optimally. We recommend consulting your vet and/or breeder (if appropriate) on how best to sustain this breed. Do Russian Bear Dogs Make Good Family Dogs? Russian Bear dogs are loyal, kind and loving to their owners and their families. But we advise you to exercise extreme caution with them around neighbors or extended family that are unfamiliar. Due to their size, they can also inadvertently knock down young children with a wagging tail or a hip, so beware! These dogs can make excellent family dogs but may be more suitable for an experienced single person or couple who have the time and energy to devote to training them. Rescuing a dog from a shelter is the best way to bring a canine companion home with you. Remember, many shelters are overflowing with dogs that need homes, making it a no-brainer to get your dog from a pet store, whose puppies have likely been born at a puppy mill. If you can’t locate a Russian Bear dog at a shelter or if you’re especially looking for a puppy, a reputable breeder could be an option. Check out our step-by-step puppy search guide to help you find your ideal puppy. These dogs are huge animals with strong natural tendencies to guard, meaning they can be extremely threatening and downright dangerous to strangers. Being independent and fearlessly bold may make them a challenge to train. Long haired Mountain types require a lot of grooming and shed heavily in the springtime. These dogs are faithful companions who will protect their owner from any foe, making them ideal guard dogs. With the right training, these dogs can be soft, loving and kind, making them a true best friend. 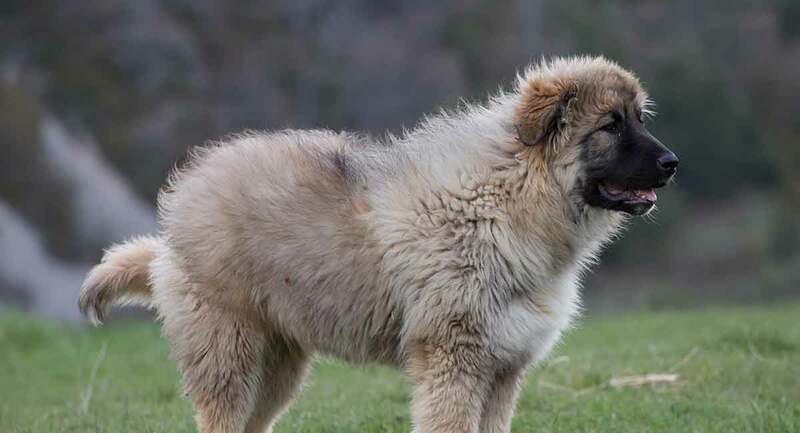 If you’re interested in a large breed working dog, but want some other options to consider, check out the Tibetan Mastiff, Tornjak or the Anatolian Shepherd! Or if you think this breed will be too much, you can always consider smaller mixes like the King Shepherd! Check out these shelters for Russian Bear dogs and please include others if you know of any, in the comments section below. Is A Russian Bear Dog Right For Me? Bringing a Russian Bear dog into your family is not something you should do on a whim. These are large, independent and potentially fierce guard dogs that need extensive positive reinforcement training. Remember, an improperly socialized or trained Russian Bear dog is a dangerous risk not only to genuine threats and intruders, but to anyone unfamiliar. That being said, if you’re willing and able to put in the work for a dog that will guard like no other, then look no further. You’ll not find a more dedicated breed, literally willing to lay its life on the line to protect its family. Interested in owning a Russian Bear Dog? If you found our guide helpful let us know in the comments! Kvalkauskas, J, 2004, Studies of hip dysplasia in dogs in Lithuania. Veterinarija ir Zootechnika. Peremans,K., Audenaert, K., Coopman, F. et al. 2003. Estimates of regional cerebral blood flow and 5-HT2A receptor density in impulsive, aggressive dogs with 99mTc-ECD and 123I-5-I-R91150. European Journal of Nuclear Medicine and Molecular Imaging. Rigg, R. 2001, Livestock guarding dogs: their current use world wide, IUCN/SSC Canid Specialist Group Occasional Paper No 1. Schachner, E. R. and Lopez, M. J. 2015. Diagnosis, prevention, and management of canine hip dysplasia: a review. Veterinary Medicine: Research and Reports. Yilmaz, O, 2007, Turkish Kangal (Karabash) Shepherd dog: History, description, breeding.